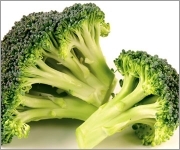 Broccoli is a plant of the cabbage family, brassicaceae (formerly Cruciferae). It is classified as the Italica cultivar group of the species Brassica oleracea. Broccoli possesses abundant fleshy flower heads, usually green in color, arranged in a tree-like fashion on branches sprouting from a thick, edible stalk. The large mass of flower heads is surrounded by leaves. Broccoli most closely resembles cauliflower, which is a different cultivar group of the same species, but broccoli is green rather than white. In the United States, the term refers exclusively to the form with a single large head. This form is sometimes called 'Calabrese' in the United Kingdom, where sprouting (non-heading) types and those with underdeveloped flower buds are also sold as broccoli.